On Thursday night I was joined by Trevor at Hexton Chalk Pit to try and see what might turn up, possibly Northern Drab...although it is getting a little late for this species now. Red Chestnut was high on my list to see this year, a moth I don't get in my garden. The day was warm and with highs of 17 degrees it was cloudy, muggy and with no wind at all, and then about an hour before I was due to go out the heavens opened for what seemed forever, the roads were completely flooded as I drove to Hexton through Stevenage and then I got to Hitchin Road and the roads were dry as a bone! Arriving at the reserve it looked really promising with the threat of rain subsiding we were confident of a good catch. Sadly it wasn't to be...the moths were really hard to come by and we struggled for just over two hours where we had had enough as it got colder and colder. 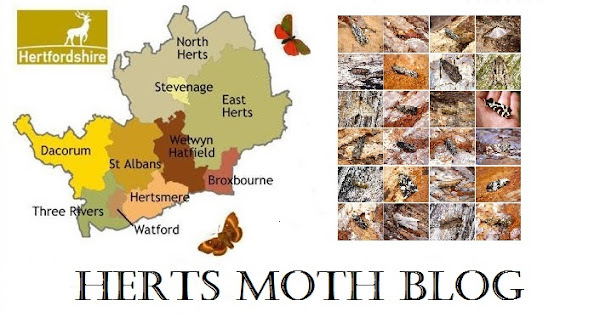 27 moths of 8 species was pretty poor from past experiences here at this time of year. It was nice to see two of our target species, both Red Chestnut and Powdered Quaker.